Abiding Radio depends on your prayers and financial support to keep this ministry on the air and on the web. There are many costs involved with bringing this Christ-honoring music to our listeners – everything from website hosting expenses and bandwidth costs to royalty fees. 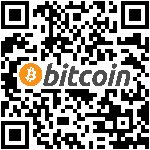 Bitcoin is an electronic, or virtual currency that utilizes a peer-to-peer payment network known as the blockchain. Some of our international listeners prefer this payment method as it does not involve international currency conversion.